The coolest shoes we've come across so far in 2011 are more than 25 years old. It's an amazing old pair of Pumas, that do just about everything a modern pair of computerized shoes do today, but worse. Edward Boches unearthed this epic ad he put together in the 80s for the Puma RS Computer Shoes, which are obviously the dopest things you could ever put on your feet. The right shoe had a printed circuit board, microprocessors, stopwatch and an "inertia switch" that was triggered by a footfall. At home, runners hooked their shoes up to an Apple II or Commodore 64 or other ancient box, where they could see a graph of distance, speed, and calories for a six year period. The complete system cost $200 for the shoe and software. Digibarn has quite a bit more about them including loads of groovy photos. The software actually sounds quite similar to Nike+ or Garmin Connect, if more primitive. And the concept is obviously shares much with today's footpods, although those back ends look a bit, er, horrifyingly bulky to run in. 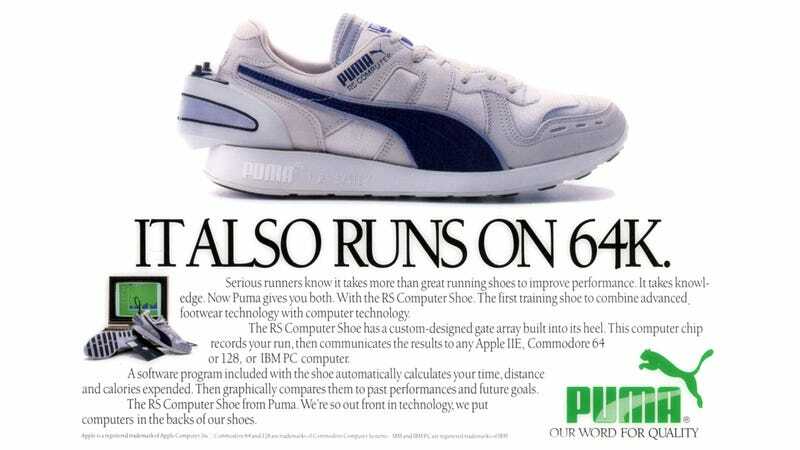 But the greatest thing about these old Pumas is the way the running community reacted to the idea of a computerized shoe at the time. 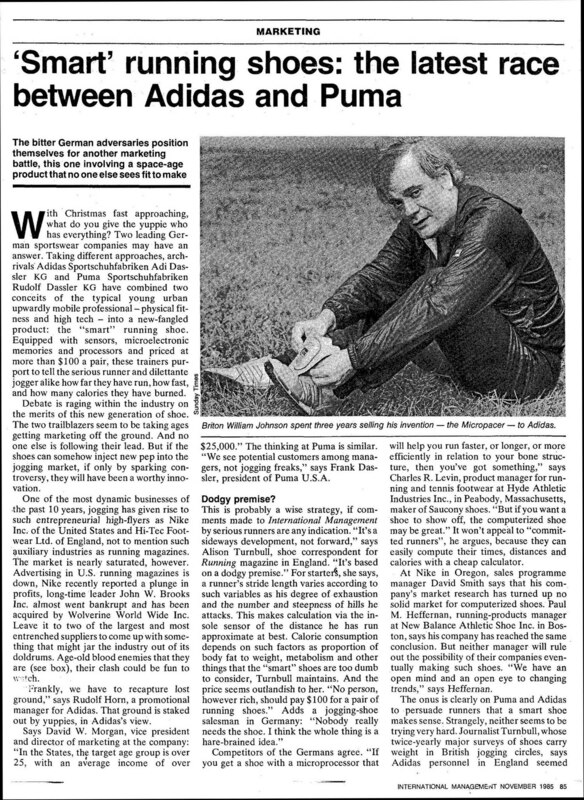 Alison Turnbull, shoe correspondant for Running magazine, called the whole concept a bit "dodgy," and argued that "no person, however rich, should pay $100 for a pair of running shoes." (Hello, Newtons!) And then there's the take by an unnamed German shoe salesman that "Nobody really needs the shoe. I think the whole thing is a hare-brained idea." And then there's Nike's conclusion that no solid market exists for computerized shoes. It was obviously a horrible idea! Someone should tell Nike, Adidas, Garmin, Polar, and Suunto right away before they sell several million dollars more of this kind of crap.